For this fun Halloween project, McCormick and Kitchen Play sent over food coloring and vanilla extract to spark my imagination into proper holiday gear. I think it worked, or I hope it did anyway. 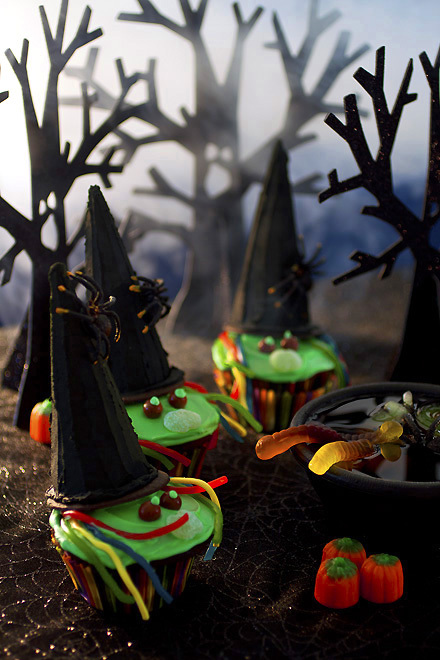 With a bit of adult help, even small kids can make these spooky cupcakes. The cone hats are fragile, so I recommend adults make those first since they’ll need time to dry anyway. The rest of the decorating, and maybe even the cupcake preparation with some supervision can be handed off to the younger set. 1. One at a time, with the black decorating icing, frost the top of a wafer cookie and the outside of an ice-cream cone. Carefully place the cone on the cookie to make a hat. Set aside to dry for 4 or more hours. Repeat with the rest of the cones and cookies. Keep any remaining black frosting for spider attachment. 2. Meanwhile, prepare cake mix as directed on package for cupcakes, adding vanilla. Bake as directed on package for cupcakes. Cool cupcakes on wire rack. 3. Tint frosting green with 2 parts green food color and 1 part yellow food color until desired color is reached. Frost cupcakes. 4. Using scissors cut the licorice in half. Take 1 of each color and place them around the cupcake for hair. Trim any ends that are too long. Frost the bottom of hats and place them on the cupcakes with enough room to place on faces. 5. Place a small amount of black decorating icing on the bottom of plastic spiders and attach them to hats. 6. Gently set Sixlets eyes and sour candy apple mouths on cupcakes. Place a couple tablespoons of green frosting in a piping bag and dot on eyes. 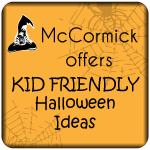 McCorm ick is also sponsoring a wonderful giveaway at Kitchen PLAY. Simply recreate any one recipe from this month’s SideCar Series, post about the experience on your blog and provide a link to your post on Kitchen PLAY to enter. All qualifying bloggers in each course will be entered to win $50 (10 prizes total). The deadline is October 31, 2011. Please review the complete contest rules before entering. Good luck! 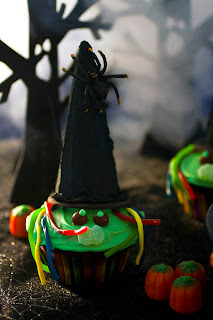 Recipe inspired by McCormick’s Wicked Witch Cupcakes. Photography by Laura Flowers. Pardon the pun, but these are WICKED cool!!!! Wow! Those are so great! You did an awesome job. These are crazy awesome! I might have to have a halloween party just for the excuse to make them! These are wickedly cute, never seen cupcake this great before, totally love them. Happy Halloween!! These are super cute! I like your spooky backdrop too. Those little witches are super duper cute! Love them.